The Trang An landscape complex is a visually spectacular mountainous karst area with numerous caves that have provided shelter to humans for 32,000 years. The site shows a large variety of karst features, with a high quality fengcong landscape of karst towers and which fengcong to fenglin geomorphic sequence is a text book example and the best of its kind in the world. Especially because of its relative small size, Trang An is a readily visible and comprehensible model of karst evolution. Hoa Lu Ancient Capital: served as a political capital of Vietnam for 42 years during the Dinh Dynasty from CE 968 to CE 1010. The Trang An Landscape in Northern Vietnam essentially is a scenic karst area with some prehistoric cave shelters thrown in. I stayed for 3 nights in the town of Tam Coc, at a homestay in the core zone next to the rice paddies and with views on the karst hills. It was pouring rain on the day that I arrived and on the third day I had planned to see another nearby WHS (the Ho Citadel), so I only had one full day in the Trang An area. In hindsight I felt that was enough, although maybe in better weather one might add more activities. I started my day of exploration on a rented bike. I rode it for about half an hour to the docking area of the Trang An boat trips. Both Tam Coc and Trang An do have regulated boat rides which are very popular and possibly the best way of getting to know this area. At Trang An, you can choose between 3 routes. They all cost 200,000 dong (ca. 7.5 EUR) and take 2.5-3 hours. Two of them pass along the popular Kong: Skull Island film set, but I went for the other one – Tour #1 with 3 temples and 9 caves. You pay at a central ticket office (which also has some exhibits, a video and even an ATM for the frequently needed replenishment of Vietnamese dong!). I was put in a boat with a German couple and a male rower. Lifejackets are compulsory: they came in yellow and orange which made for more colourful scenes along the way than the drab weather otherwise delivered. Although I had arrived relatively early at 9.15 am, there were dozens of boats already plying their route. Never did it feel too crowded though, we mostly saw others only on the long stretches. Our first cave entering by boat was the most spectacular one: the Toi Cave is over 300 meter long, dark and with a very low and spikey ceiling. We sat on our benches bent forward and heads down for most of the time. 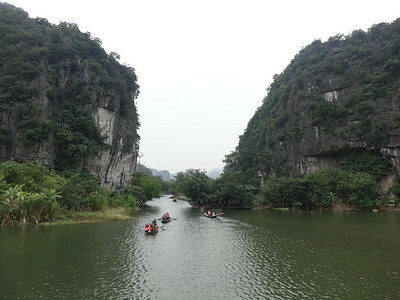 The area’s most distinguishing feature from for example the Guilin karst area is the presence of ‘karst cockpits’. These are self-contained depressions filled with rain water, fully surrounded by high karst towers and with no obvious entrance or exit. It’s magical when you come floating out of a dark cave and just find yourself in a kind of pond with hills on all sides. From the in the boat tour included temples, I enjoyed the Tran Temple the most. It takes a lot of steps to get there but it has a very nice setting. After lunch I cycled to the Thai Vi Temple, on the other side of Tam Coc. This is a very fine bike ride on narrow paths between the rice paddies. On the way you encounter several shrines, one of them (Thieng Huong Dong) spectacularly constructed in yet another cave. Trang An did have a hard time in being admitted to the WH List. Both ICOMOS and IUCN advised a Deferral, which were fully overturned by the WHC. And indeed, its cultural claims – prehistoric people lived seasonally in caves in the area - are poor and the focus on the many temples & pagodas in the nomination file (but not part of the OUV) did not humour ICOMOS. Its natural features though should have been enough. For a seasoned traveller, it is easy to get complacent about WHS like this – do you need to go and see Trang An if you already have been to the South China Karst and Ha Long Bay? Well, for its original karst features I think Trang An can easily hold its own. The ratings so far on this website (a score of just over 3.5 out of 5) seem to underline this. I remembered the first time I went to Vietnam with my friends in 2008, we had one free day, and our host asked us to choose between Ha Long Bay in the sea and Ha Long Bay on land for sightseeing. We decided to visit the celebrated Ha Long Bay in the sea as we did not heard Ha Long Bay on land before. Almost a decade later the Ha Long Bay on land become a World Heritage Site under the name of Trang An. While my friend and I planned a visit to Trang An, we found out that actually it was the famous Tam Coc, but after further searching, Trang An and Tam Coc are in the same area but located on the different sides of the mountain, while Tam Coc is famous for its rice fields, Trang An is well known for its pristine environment and numerous caves. So the question of which part of this scenic landscape we want to see, the famous Tam Coc or the less well known Trang An, eventually we have visited both areas. After Ho Citadel, our group traveled to Trang An and reached our hotel, Hang Mua Ecolodge which was located inside the Core Zone of World Heritage. After checked-in, we climbed almost 500 steps to the famous Mua Cave, a view point on the mountain, to see great view of Tam Coc at sunset. The view of karstic mountain, rice fields and lake reflecting sunset sky in pink and orange were just breathtaking. Next day we started our day at Bich Dong Temple, a lovely small temple. The view at the temple gate was just perfect with stone bridge, Chinese styled arched gate and lush forest on the lakeshore. The temple was built in three levels next to the high cliff, first level was a typical Vietnamese temple, but for the second level was a real highlight with lovely shrine attached to the cliff, behind the shrine had passageway into the cave, inside the cave has nice stalactites and another shrine making the cave very beautiful. At the end of the cave was a way to third level where another shrine located, the shrine was simple but the view of Tam Coc was lovely. Then we proceeded to Trang An. There was a large tourist complex building at the entrance that similar to temple. Hundreds of boats were waiting for the customers, we bought ticket and then went to the pier, here we had to choose short course, about 1.30 hr., or long course, about 2.30 hr. without any stop. Each course used different routes and had its own highlights, we decided for long course since it is unreasonable that short and long courses were the same price so we wanted to maximize our money. The maximum for each boat was 4 tourists and one boatman. 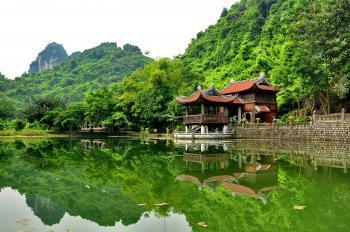 The view of Trang An was lovely with classic view of karst mountains, forest with decorative temples, pavilions, gates and bridges, a very classic Chinese landscape. The highlight of Trang An in my opinion was its many numerous caves which were water channels that link each valley together some kind of subterranean rivers. These cave tunnels were really fun to go thought as the caves’ ceiling were really low and winding, it was incredible how the boatman could navigate without any bump to the wall. We had to dig ourselves into the boat to avoid our heads hit with dripstones. Along the route, there were many stops for tourists to relax or climb the mountain for viewpoint, but since we already saw Mua Cave and Bich Dong, we already lost interest for another viewpoint, so we told our boatman to keep going without any stop, something we really regretted as we found out that he was really tried and his hand were shaking from our restless demand. In the boat there were two extra oars, so for the last 45 minutes, we helped our boatman row the boat, quite an experience. Trang An, in my opinion, is a very nice place to visit, the landscape is beautiful but actually cannot compared to the famous view of Guilin in China. Its environment was still very pristine, the water was very clean and cool. Almost 3 hours boating in such nice surroundings were really enjoyable until the last ten minutes of our trip was greet by great sunshine, which were very hot and made us very uncomfortable. However, I would not rate Trang An as a great World Heritage Site, the site is too similar with typical South China’s karst landscapes, its cultural value is not that outstanding. Nevertheless it was a lovely site, a good stop to relax before or after Hanoi. One recommendation come to visit early to avoid sunburn since there were no shade on the boat and help your boatman row the boat. Another tip Trang An is famous for its goat meat food, a bit pricy but good to try. I visited the Trang An Landscape in April of 2015 and really enjoyed the experience. It is a beautiful area that you can spend quite a lot of time exploring. In order to see it, I did the standard Trang An boat tour which costs 150,000 dong and takes about two hours. While it is quite popular with (local) tourists groups, you are in a boat of just six people so it is not as touristy as it could be. The boat takes you through caves and to little waterscapes you wouldn't be able to access otherwise. There is no shade on the boat so, a word of warning, make sure to take sun protection and some water! To get to Trang An you can get a direct train from Hanoi to Ninh Binh and then a taxi from there (about 75,000 dong). I actually stayed overnight near Ninh Binh (you can get here on a direct train from Hanoi) and enjoyed spending a couple of days cycling around the region and seeing some other natural areas. They may not technically be part of the WHS, but they look the same. then the tour moved on to a lunch buffet at a local restaurant which was quite decent local food. 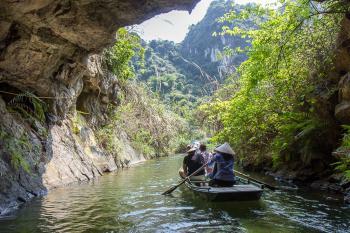 the highlight of the tour is the boat trip to visit the Trang An grottoes. the locals row the boat by foot with 2 to 3 passengers. Along the way, rice fields besides the river and limestone karst mountains not too far away. the river cut through a few mountains, so able to go under it. the rower would ask for tips in the middle or by the end of the tour. the extra bonus is bicycle riding after this. following the guide, i visited another temple which seems to be more recently built but with a old pagoda and with rice fields all around. i think the trip would be a nice family outing. there are many local tourists maybe from Hanoi joining the boat trip. In term of unesco value, it may lack quite a bit. i dropped off from the tour in ninh binh and took a local bus to visit the citadel of the Ho Dynasty. Dubbed as another WHS: "Dry Ha long Bay" or "Inland Ha Long Bay"
Recommended for combination by AB: 1. With the South China Karst (but "Given there is already an ongoing process of extension of the South China Karst World Heritage Site in China, it appears to be difficult to insist on Trang An being directly connected to that process") 2. With Ha Long Bay ("What appears to be more appropriate to recommend is that Viet Nam might consider a parallel process to the Chinese South China Karst nomination, where a number of key karst sites have been nominated as part of a coordinated process, in a national serial approach. Noting that a key comparison for Trang An is the site of Ha Long Bay, the relationships to Ha Long Bay and the adjoining Cat Ba Archipelago would seem to warrant further consideration, notwithstanding the challenges of Trang An being nominated as a mixed site."